Recently ranked as the number two fine arts graduate program by U.S. News and World Report, the School of the Art Institute of Chicago (SAIC) encourages investigation that is interdisciplinary, collaborative, and experimental. Our graduate programs prepare students for innovative thinking and making. RSVP for SAIC’s Graduate Open House at saic.edu/grevents or 312 629 6100 or gradmiss@saic.edu. 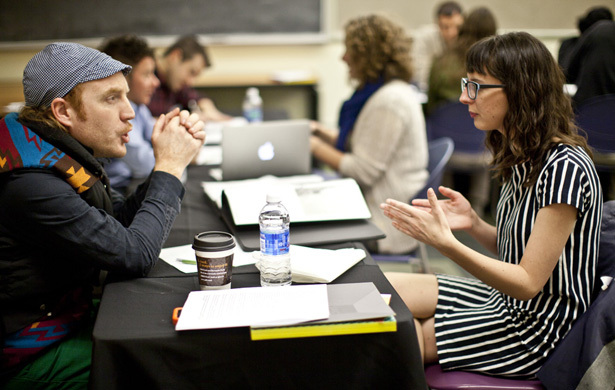 Bring your portfolio and speak with SAIC faculty and admissions staff. Get feedback on your work, or just ask questions about graduate study at the nation’s most influential art and design school. These events are designed to bring SAIC faculty, admissions and administrative staff to your area to meet with prospective students, present curricula and facilities, feature graduate students’ experiences, and answer questions about the admissions process. Join us in Atlanta, Austin, Boston, Los Angeles, Toronto, New York, San Francisco, and Seattle. 800 232 7242 or 312 629 6100 to talk to a graduate admissions counselor. A leader in educating artists, designers, and scholars since 1866, the School of the Art Institute of Chicago (SAIC) offers nationally and regionally accredited undergraduate and graduate degrees and post-baccalaureate programs to nearly 3,200 students from around the globe. Located in the heart of Chicago, SAIC’s educational philosophy is built upon an interdisciplinary approach to art and design, giving students unparalleled opportunities to develop their creative and critical abilities, while working with renowned faculty who include many of the leading practitioners in their fields. SAIC’s resources include the Art Institute of Chicago and its new Modern Wing; numerous special collections and programming venues provide students with exceptional exhibitions, screenings, lectures, and performances.